The last time I trekked to the northernmost reaches of California to the city of Redding to visit my in-laws, I brought along my essential beauty belongings — my hairbrush, some dry shampoo, makeup (of course) and about 10 gallons of moisturizing lotion. Redding’s a lovely town up near Mount Shasta, not far from the Oregon border, but it’s also one of the DRIEST PLACES ON EARTH. The air there is so dry, or at least drier than I’m used to here in the Bay Area, that my lips and skin ache after one or two days. Seriously, my arms and legs, my hands — the skin all over my whole dang body — which is already hella dry to begin with, feels like it’s being sucked dry by an industrial strength vacuum cleaner. 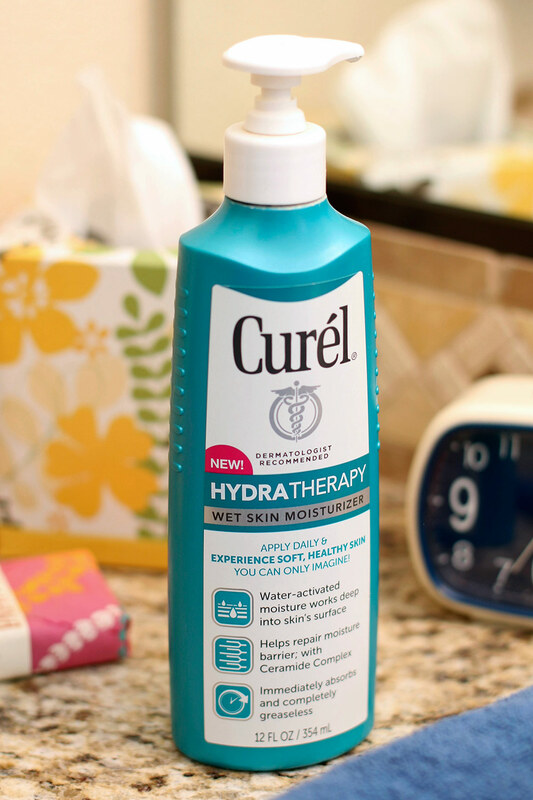 Can Curel Hydra Therapy Wet Skin Moisturizer handle Redding? 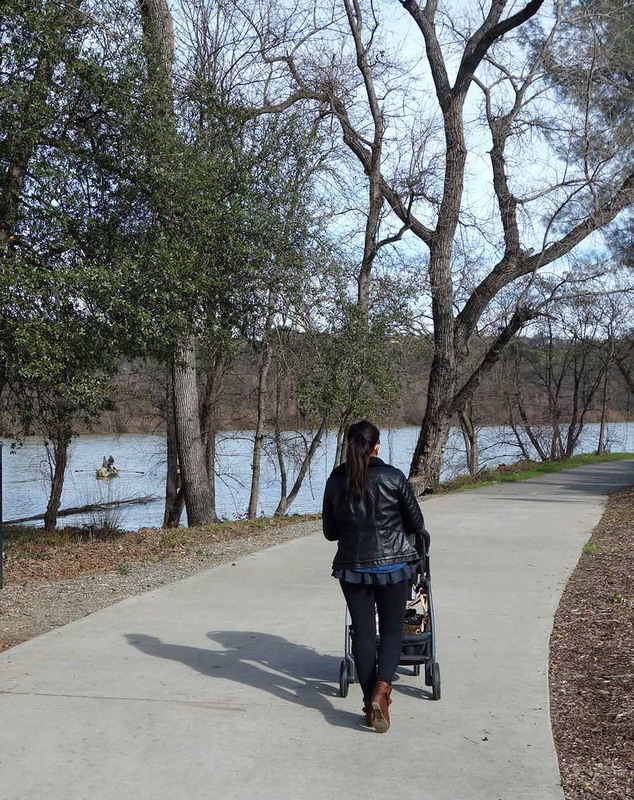 If you ever visit Redding, my advice to you is this: take a walk along the Sacramento River Trail around sunset, because Redding has some of the best sunsets in the world. Also, bring along some mega-moisturizers. Wow, Curel Hydra Therapy Wet Skin Moisturizer… It’s so unusual! Most of the time when I think of incredible moisturizers, I think of rich, greasy body butters and body balms that you have to massage into your skin FOR DAYS. They get the job done, but they take a lot of work. 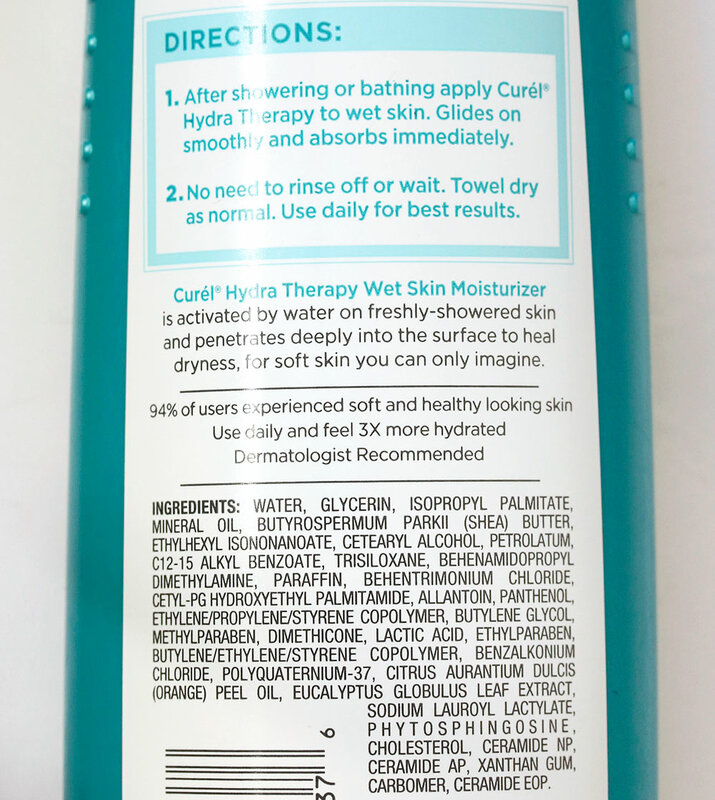 The idea behind Curel Hydra Therapy Wet Skin Moisturizer is that it doesn’t. All you do is apply it on wet skin after you finish taking a shower and before you dry off. Healthy skin has these things called ceramides that help to maintain a moisture barrier and keep your skin hydrated, so when ceramide levels drop, the moisture barrier takes a beating, and your skin gets dry. 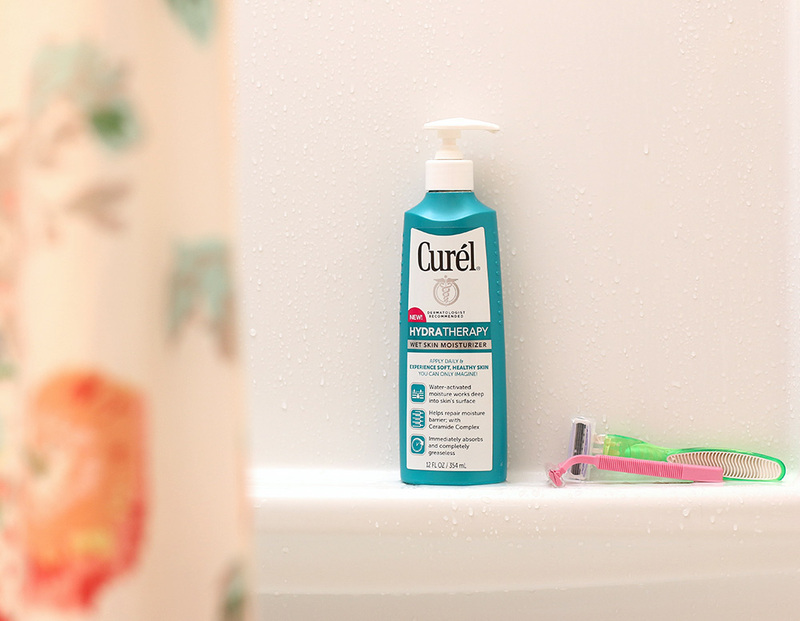 Curel Hydra Therapy Wet Skin Moisturizer contains ceramides, and when you use it right after showering, the ceramides go to work repairing the moisture barrier. 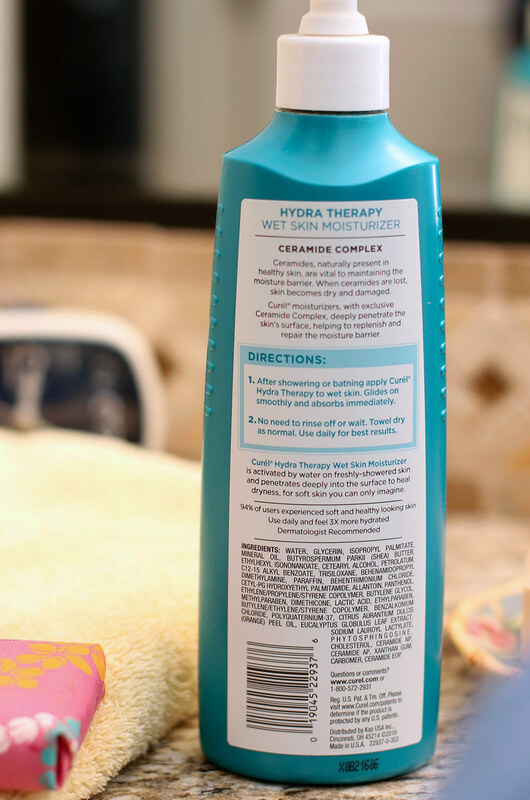 Right after I finish my shower and turn off the water, while I’m still sopping wet, I pump a few pumps of Hydra Therapy into my hands and coat myself from the neck down (if you’re curious, the formula’s fragrance free, so it won’t clash with your perfume). I don’t spend any time rubbing it in. None whatsoever. I just literally coat my skin with a layer (typically while singing the opening lines to whichever song is currently stuck in my head). Then, I pat myself dry with a towel, and that’s it! By the time I reach the end of the song, my formerly dry skin feels smooth, soft and moisturized to the hilt. Plus, it doesn’t feel greasy or sticky at all. Grab a bottle one of these days. If you have perpetually parched skin like I do, I think you’ll love it. Thanks for sharing about this moisturizer, Karen. I would love to visit northern California again in the near-ish future…but I need to visit someplace warm and humid first!! This Illinois winter is no joke!! I’ve never tried a moisturizer like this, but I really like the idea behind it! You should! What parts of NorCal have you visited? I took a road trip from OKC to San Francisco and Oakland one summer! It’s been a looong time…And I see from the comment below, I’m not the only one suffering this IL winter, wOot!! Thank GOD we’re going to Florida next month!! But Karen, I have LOVED living in Chicago and you will LOVE visiting Chicago. Yes! This Illinois winter snow has me inside and looking up tickets for Florida…not that I can afford that but still the thought of Florida is like bliiiiiiiiiiiiiiss. UGH! Tell me about it. It was warm here for the past few days but now the cold is back. WAH! Take me to a tropical place, please! Where would you go if you could visit Florida? I’d go back down to the Florida Keys. Is there no greasy residue with this lotion Karen? Does it absorb evenly and you don’t rub it in and does it have a smell? Nope, no greasy residue, and it’s unscented. I think it absorbs evenly and quickly. I used to live 20 miles south of Redding in Cottonwood. I know it’s dry!! It’s more humid in So Cal, but I’m gonna give Curel Hydra Therapy a try. Thanks for the tip! Oh how interesting! I don’t think we’ve ever stopped by Cottonwood; we usually just drive straight through if we can. How long did you live there? Why would you?! 😉 I wouldn’t except my dad is still there. Although, Roger’s Frosty does have the best Chili Burrito, I ever tasted. but the summers there are heck-a-hot and dry!! LOL, hey, you just never know… It would give me an excuse to get out of the car. El Hub does love his burritos, so I’ll try to get him to stop by Roger’s Frosty next time we drive through. Summers up there are KILLER. I read somewhere a long time ago that Redding (and the area) get the most sun per days of the year? I don’t know if that’s still true. But yeah… when we visit in the summertime the only time I go outside is when I’m running from an air conditioned space to the car. Ya know, I’ve never lived in So Cal. How is it down there? I hear that you’re always in traffic. I am in Garden Grove. I am about 5 miles from the beach in one direction and 5 miles from Disneyland in the other, but in suburbs, not like a downtown. So we still have abundant street parking. There’s traffic but always moving, so it’s not bad. But if I wanna go to LA or even to just get outta town, I do have to plan it around rush hour, either really early around 5am or after it dies down about 9:30am. You get used to it, I guess. Do you like it better than Nivea or Kiehls? How much does it cost as well? I didn’t see the price. I do! It’s about $10 for a bottle. I love your blog… I can honestly say that I look forward reading your newest posts every day. The latest one about Curel was a little bit disappointing. I’m an avid ingredient reader and I’ll never buy anything before reading what is made of. Curel is loaded with questionable ingredients, from petroleum derivatives to couple of parables, which can cause a big harm on the long run. Unfortunately, the ceramides are the last ingredients on the label therefore the least present or almost non existent in the product. Sorry it took me a while to get back to you. Connor’s been a needy sandwich all morning (aka having a “high needs” day), so I’ve had to do some juggling today (and drink a LOT of coffee… so tired). It happens sometimes. Anywho, thank you for reading the site and for your insightful comment. It’s important to look at all the sides when exploring a product, and it’s something that I’m glad other readers can consider when making their beauty decisions. So thank you! Its a bit out of context but:)) may i ask what are your fav bags for baby stuff? Or diaper bag? 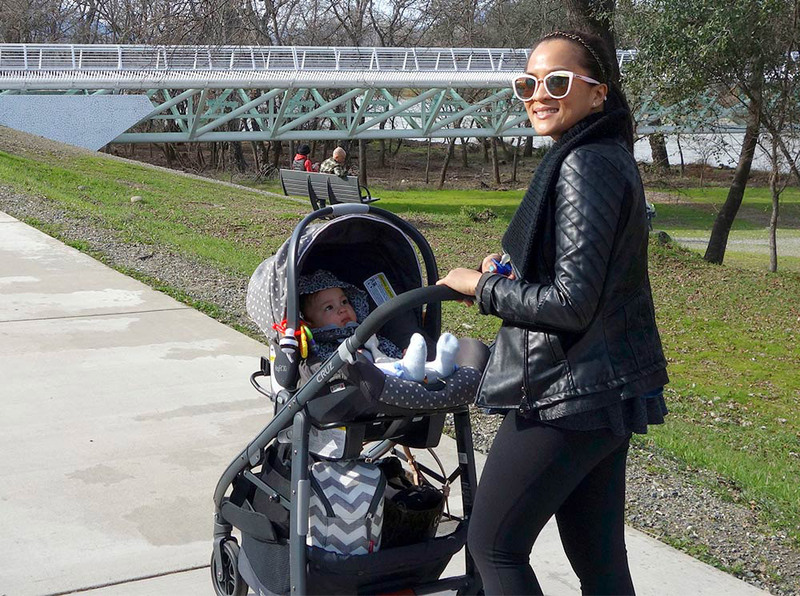 And do you have a favourite stroller? Happy to help with baby recommendations! I have a diaper bag by Skip Hop which I got from Target. It’s the Skip Hop Duo Signature Diaper Bag in Black. I chose black because it doesn’t show dirt easily and wanted a color that El Hub wouldn’t feel silly carrying. 🙂 It has a lot of pockets and fits everything! I also like that I can carry the bag cross body if I want. 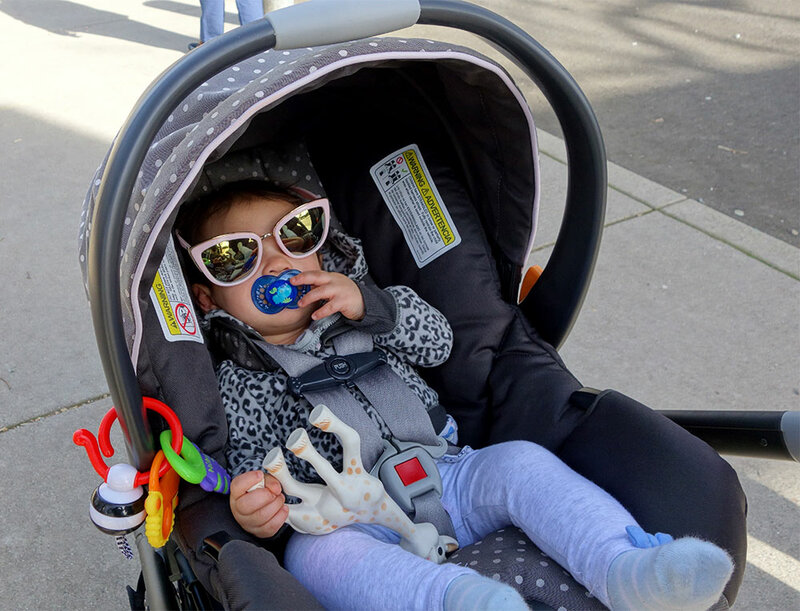 For a stroller, we use the Uppa Baby Cruz (got it as a gift), and for the last year we’ve been using it with our Chicco infant car seat. 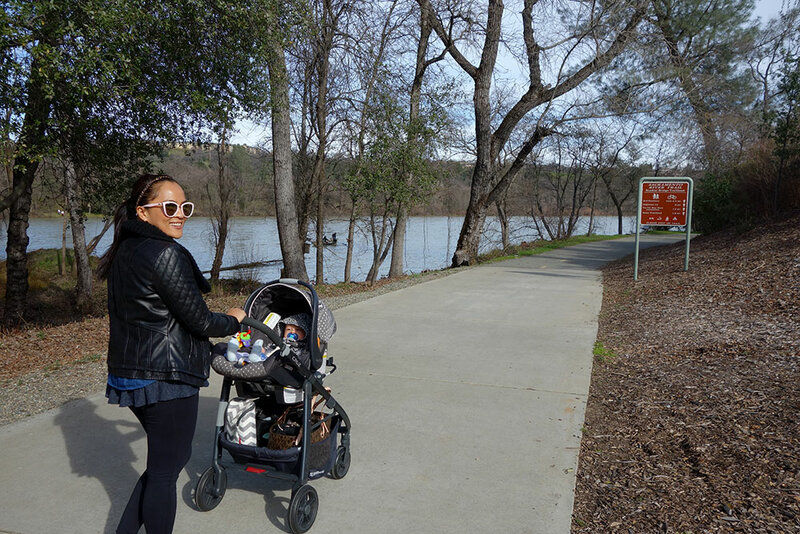 It’s convenient and roomy and easy to handle, but to be honest I’m not really a stroller person. I prefer to carry my daughter in a baby carrier. I get to be close to her and it’s a good workout! Plus it’s easier to do everything when I have two hands available. The baby carrier I use is the Ergo Baby 360, which I didn’t really start using until Connor was 6 months old. Before that I used the Moby wrap. You’re so welcome! Another thing that I love that REALLY helped us was the Chicco pack ‘n’ play. We use that thing A TON. Ahh, congratulations! The Skip Hop Duo surprisingly fits a TON of stuff. Seriously, I shove so much in there, it’s crazy! I really love it. Her name is Meyra, it means shining light in turkish. I’m excited to try this product! My skin gets so dry in the winter and it seems like I can never use enough moisturizer. I’ve also started dry brushing so I hope that helps. P.S. I love that black jacket you’re wearing! I feel the same way about moisturize, ha! It’s like I’ve spent half my life slathering the stuff on my limbs. OOOH… so how are you liking the dry brushing? I tried it for a second (seriously, like a second) right before Connor was born, but I didn’t keep up with it because I think my skin was super sensitive when I was pregnant. I might try it again. Totally not lotion related, but the T-Rex (my nephew) has totally become obsessed with giraffes (along with his obsession with horses) and I noticed Connor Claire is holding a giraffe toy. Where did you find such a toy? I’ve looked everywhere! That’s Sophie la Giraffe! She’s a famous teether toy from France. 🙂 Connor loves hers! Dry? Try Alberta in winter (I’m in Edmonton). I can’t walk across the floor without building up a static charge that sparks as soon as I touch something lol? I LOVE this moisturizer!!! I received this in the mail, and I am got a 4$ coupon with it, and rest assured, I will be purchasing it. I love how quick and easy it is — how quickly it absorbs….. just everything about it!!! It steps up my shower routine by several minutes but not having to apply lotion ‘after’ my shower!!! Love that it’s not scented, and how wonderfully moisturizing it is. It really doesn’t take much, and the price is just right. Thanks so much for the review – good to hear your thoughts on this great product!!! I’m usually a Aveeno girl, but this is game changing!!! Love it!!! I love that pic of Connor – styling with Sophie. 🙂 I am definitely a fan of lots of moisture but have such a strange issue with putting lotion on my wet skin and then toweling off. I know I just need to try it but I’m oddly resistant. I do think it’s a better idea than the “in shower” lotion, which is just a broken neck waiting to happen when I wipe out on the slippery shower floor. HAHA!